Grand Californian Hotel The first Disney resort to be located inside a theme park, Disney California Adventure, the Grand Californian celebrates the turn-of-the-century romantic Craftsman movement of California. The design captures the artistic exploration of California’s coastline, with its Monterey pines and redwood forests, layered with the memories of the Arroyo craftsmen, the mission pioneers, the Plein Air school of painters, and daring architecture. There are 712 standard rooms, 34 Artisan suites, two vice presidential, and two presidential suites, along with a convention center featuring a large ballroom. Restaurants are the Napa Rose, Storyteller’s Café, and White Water Snacks. The hotel welcomed its first paying guests on January 2, 2001, with the first event held in the hotel’s ballroom earlier on December 1, 2000. Grand opening was on February 8, 2001. 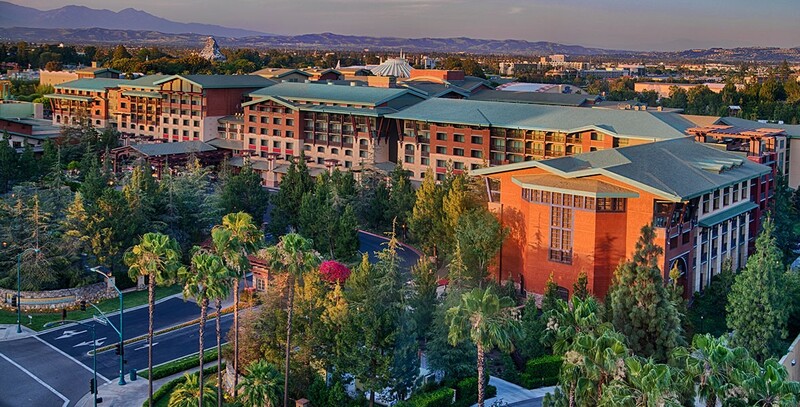 On September 23, 2009, a vacation club addition—The Villas at Disney’s Grand Californian Hotel—opened with 50 2-bedroom villas and 203 traditional hotel rooms, plus a new swimming pool and additional valet parking spaces.